So this was inspired by the lovely Kerry, and also the fact that today i bought myself a new outfit!! YAY! Please excuse the pose, my mother forced me to do it lol! 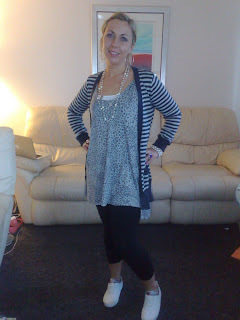 I love this outfit, its amazing as you lose weight you can wear clothes you would have once never considered. I can assure you this is an amazing feeling! So believe it or not this entire ensemble is from New Look. I go through phases with New Look sometimes i love it others i hate it. Well it is back on form and i'm currently loving it! So we have a grey leopard print over sized vest coming in at £16, some cropped leggings with lace detailing at the bottom for £7, and the Nautical Grey and Navy Cardigan for £22! Plus i received student discount so i got 10% off of everything! 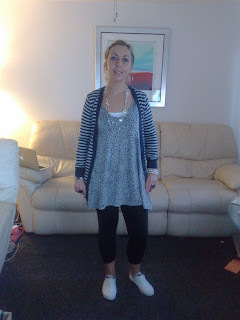 I also layered a plain strappy top from Primark underneath the vest and the White Pumps are from H&M. I really like this! Let me know what you think!! i know how you feel about getting to wear what you want! Well done your doing so well! amazing, you look casual yet sophisticated! You look really nice :) Im the same with new look but I went in a week ago and was quite impressed!